American Standard Water Heaters is dedicated to maintaining the pillars of our business; Quality, Service and Innovation. In an effort to provide you with superior products, we have decided to implement a procedure to evaluate a limited batch of residential gas water heaters that may not live up to the Standard you have come to expect from American Standard. Below is a detailed outline of a series of Water Heaters that may possibly have a manufacturing defect and the procedure to identify, diagnose and repair or replace the water heater in your home or business. This voluntary recall involves atmospheric gas water heater models (Natural Gas and Liquid Propane) in 30, 40, & 50 gallon configurations that were manufactured from June 2015 to February 2016. The tanks are white in color and have an American Standard “Dura Glass™” label which is Blue, White and Red in color. The label will be oriented at the top 1/3rd of the tank. 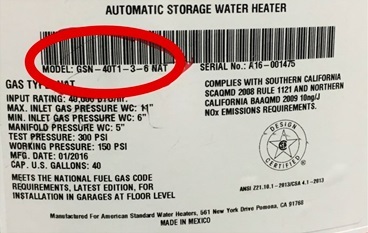 The rating plate found near the gas valve on the water heater provides necessary information (such as model number, manufacturing date and serial number) to identify if your heater is affected by this recall. Please identify the serial number which begins with a capital letter followed by two numbers; [Example – A16, B16 or M16] and enter that complete number into the form to the right, titled “Serial Number". 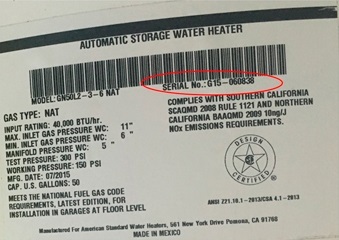 After testing, it has been determined that a limited batch of American Standard Residential Gas Water Heaters, in the GN & GSN product line, may have a potential manufacturing defect which resulted in defective sealing of the flange between the burner and combustion chamber that during extreme conditions could allow outside flammable vapors to enter the combustion chamber and ignite. If you suspect that your heater may be affected by this recall, please discontinue use of the Water Heater immediately and contact American Standard Water Heaters at (888) 883-0788. Consumers must also ensure that the heater is not in the vicinity of combustible materials and vapors. If these materials are present they should be removed from the surrounding area immediately!